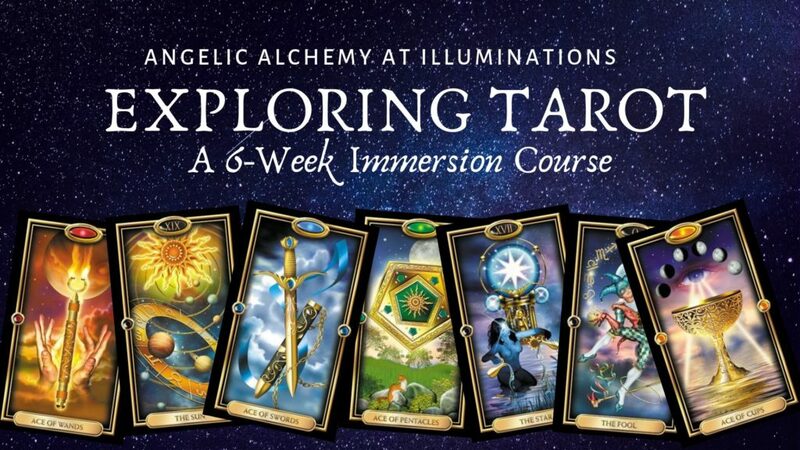 Exploring Tarot: A 6 Week Immersion Course - Illuminations! In this 6-week course we will not only cover the history, fundamentals and elements of the Tarot, but will also dive into its ability to take us on a journey of self discovery, healing, and divination. This course will be much more than Tarot knowledge and card information as you will have the opportunity to explore into this sacred tool and create a deeper connection with yourself and others by using the Tarot as a bridge. By the end of this course you will have gained the resources to continue your own Tarot practice and the confidence to read for yourself and others in your own unique way. To start this course we will cover the history and basic fundamentals and elements of the Tarot, get a clearer picture as to why you wish to learn and explore this divinatory system, how to choose and care for a deck, types of readers and readings, and spreads to get you started. We will also have hands on intuitive practice with the Tarot and time for Q&A. Weeks 2-5 will follow a similar format exploring the Minor Arcana. This week we will look at the Swords as a whole and the elements this suit encompasses along with each card and its meaning. We will also explore your own interpretations by practicing picking out symbols and reading the art or imagery and having hands on intuitive practice. This week we will look at the Wands as a whole and the elements this suit encompasses along with each card and its meaning. We will also explore your own interpretations by practicing picking out symbols and reading the art or imagery and having hands on intuitive practice. This week we will look at the Cups as a whole and the elements this suit encompasses along with each card and its meaning. We will also explore your own interpretations by practicing picking out symbols and reading the art or imagery and having hands on intuitive practice. This week we will look at the Pentacles as a whole and the elements this suit encompasses along with each card and its meaning. We will also explore your own interpretations by practicing picking out symbols and reading the art or imagery and having hands on intuitive practice. In this final week we will cover the Major Arcana and each card meaning, the “troublesome” cards and how to read them, and creating your own spreads. We will also have hands on intuitive practice and end this course by providing a reading for another person. Each class includes worksheets with detailed information to use as a resource for your own Tarot practice. or you can go to https://squareup.com/store/angelicalchemy to purchase online.